DONETSK, Ukraine -- Pro-Russian gunmen seized buildings in eastern Ukraine, as new flashpoints developed in the ongoing crisis over the region's future. Armed pro-Russian activists carrying riot shields occupy a police station on Saturday, April 12. The unidentified armed men arrived at the building in the town of Slaviansk in the morning and took control of it without any casualties. Ukraine has seen a sharp rise in tensions since a new pro-European government took charge of the country in February. Moscow branded the new government illegitimate and annexed Ukraine's Crimea region last month, citing threats to Crimea's Russian-speaking majority. As tensions rose, acting President Oleksandr Turchinov held an emergency National Defense and Security Council meeting Saturday evening in the capital Kiev, according to the President's press office. In the eastern city of Kramatorsk, police and pro-Russia activists exchanged gunfire, acting Interior Minister Arsen Avakov's spokeswoman, Natalia Stativko, told CNN on Saturday. Slightly north, in the town of Slaviansk, gunmen in camouflage stormed and seized a police building early Saturday, authorities said. They arrived in two mini-buses, came to the police station and opened fire at the building before getting inside the facility through windows, the Donetsk regional police press office said. Three police officers were slightly injured. The gunmen introduced themselves as part of the Donetsk republic initiative group, police said. Their goal was to seize hundreds of weapons inside the police building; they allowed the police officers inside to leave the facility, the press office said. A CNN team in Slaviansk saw dozens of armed, well-equipped men in camouflage in control of the Ukraine Security Services (SBU) building, as well as the police building. The men did not want to be filmed. Makeshift barricades have been erected around both buildings. Locals brought food and tires to the armed men at the SBU site. "We're for democracy, for the rights of the people to express their will," one pro-Russian armed activist in Slaviansk told Reuters. "We want to create a people's republic, a real one, one in Donetsk, one in Luhansk, and in general let the people of the southeast determine what they want. We want to hold a referendum." A police building in the town of Krasni Liman also had been taken by protesters, according to Stativko, the spokeswoman for Ukraine's acting interior minister, although the CNN team saw no evidence to that effect. Special units are being sent to both Slaviansk and Krasni Liman to assess the situation, she said. The latest reports come amid heightened tensions in the country's largely Russian-speaking eastern region, centered on the cities of Donetsk, Luhansk and Kharkiv. Pro-Russian protesters in those cities seized government buildings several days ago and remain barricaded in some. In Donetsk, the chief of regional police has resigned. Kostyantyn Pozhydaev announced his resignation during a pro-Russia activist rally outside the police office, the Donetsk regional police press office said in a statement Saturday. Earlier Saturday, the acting Ukrainian President's website stated that the Head of the Security Service for the Donetsk region, Valery Ivanov, was sacked. 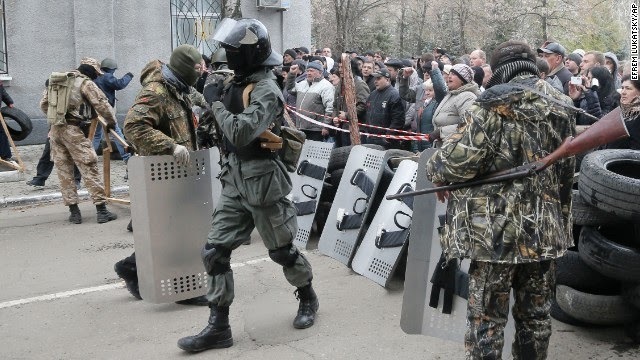 A demonstration was held in front of the Donetsk police headquarters Saturday, according to the interior ministry. Although life in most of the city continues as normal, protesters still hold government buildings. Prime Minister Arseniy Yatsenyuk paid a visit to Donetsk on Friday as he seeks to rally those in the region -- which has strong ties to Russia -- behind the interim government in Kiev ahead of elections due on May 25. He suggested that constitutional reform could give more power to the regions, though the time frame is short. "We almost don't have time to amend the constitution before the presidential election," he said, adding that they need to move fast so that any new president doesn't dictate terms. The United States has accused Russia of fomenting the separatist unrest in its neighbor as a pretext for military intervention. U.S. Secretary of State John Kerry spoke by phone with Russian Foreign Minister Sergey Lavrov Saturday, expressing "strong concern that attacks today by armed militants in eastern Ukraine were orchestrated and synchronized, similar to previous attacks in eastern Ukraine and Crimea," a senior State Department official said. The two diplomats had met late last month in Paris to discuss the crisis. The official said that Kerry warned Lavrov there would be "additional consequences" if Russia did not take steps to de-escalate the situation in eastern Ukraine and move its troops back from its border with Ukraine. The official also noted that militants involved in Saturday's unrest in eastern Ukraine "were equipped with specialized Russian weapons and the same uniforms as those worn by the Russian forces that invaded Crimea." The White House also reacted Saturday, calling on Russian President Vladimir Putin and his government to "cease all efforts to destabilize Ukraine." "We are very concerned by the concerted campaign we see underway in eastern Ukraine today by pro-Russian separatists, apparently with support from Russia, who are inciting violence and sabotage and seeking to undermine and destabilize the Ukrainian state," said National Security Council spokeswoman Laura Lucas Magnuson, in a statement. "We saw similar so-called protest activities in Crimea before Russia's purported annexation." Vice President Joe Biden will travel to Kiev on April 22, to meet government leaders and members of the civil society. "The Vice President will underscore the United States' strong support for a united, democratic Ukraine that makes its own choices about its future path," the White House said in a statement. U.S. State Department spokeswoman Jen Psaki, in a tweet, described the situation as "worrisome. "Russia again seems to be behind" the unrest, Psaki said Saturday. Meanwhile, the U.S. Treasury on Friday imposed a third round of sanctions on individuals considered to be involved in Crimea's annexation. They include six individuals classed by the Treasury as Crimean separatists, former Ukrainian official Sergey Tsekov, and the Crimea-based natural gas company Chernomorneftegaz, which the Treasury says has appropriated assets belonging to Crimea's state-run gas company. "Crimea is occupied territory. We will continue to impose costs on those involved in ongoing violations of Ukraine's sovereignty and territorial integrity," said Treasury official David S. Cohen. Next Thursday, EU foreign policy chief Catherine Ashton will meet in Switzerland with foreign ministers from the United States, Russia and Ukraine to discuss efforts to de-escalate the situation. That meeting will follow talks between EU foreign ministers on Monday in Luxembourg. EU defense ministers are also due to meet Tuesday, with the situation in Ukraine high on the agenda. Western powers say they want to resolve the crisis through diplomatic and political means, and have warned of tougher sanctions against Russia if it intervenes further in Ukraine. Ukraine acting Foreign Minister Andriy Deshchytsia and his Russian counterpart, Sergey Lavrov, spoke Saturday by phone to discuss preparations for Thursday's meeting, Ukraine's Foreign Ministry said. In the call, Deshchytsia demanded that Russian special services agents end their "provocative actions" in eastern Ukraine, which are intended to derail the Geneva meeting and impede efforts to resolve the crisis, the ministry said. Lavrov said Friday in a televised interview on Russian state television that there are no Russian troops or Russian secret services agents in southeastern Ukraine, the official ITAR-Tass news agency reported. He also said Russia has no intention of absorbing the southeastern regions of Ukraine, contrary to the fears of the West. Russia annexed Ukraine's southeastern Crimea region last month, following a referendum condemned as illegal by Kiev and the international community, and the West fears it may next seek to enter eastern Ukraine.